Time really flies! Four years have passed since Dave Green visited us last time. Dave is the president of Conceptis puzzles, which provides my fix for Japanese puzzles. I have visited in Israel four times now but Dave has been in Finland only twice and both times in October, when Finland is dull, grey and dark. No snow yet but all the trees have dropped their leaves and the weather is awful. Now I had the chance to show Finland in all it's beauty and light. There is something magical in the Finnish summer. I will tell about things which made an impression to Dave. Since I am not sure about his order of preference, I have listed them chronologically. Dave was travelling by plane from Moscow and we picked him at the airport. The weather was hot and sunny. My Israeli friends have always warned me about the hot weather in Israel in the summertime, and now I had the chance to show Dave, that ours it not so very different. The air was very moist and we could actually feel a thunderstorm coming. On our way, quite near Turku, we actually had some rain and saw lightnings. In Turku the sun did not shine but it was still about 30 degrees Celsius. The thunderstorm reached Turku later, when Dave was in his hotel resting. Sunday the weather was hot and sunny again, except when Dave wanted a break for rest and some work on the computer we had a huge thunderstorm with lots of water again. As if Dave was good friends with our ancient god of weather, Ukko. Three hours later when he was ready, the weather was very nice again. After Dave's rest after the trip he was hoping for some coffee and I knew exactly the place where to take him. Turku is situated on the southwest coast of Finland at the mouth of the Aura River, and the centre of Turku is located on both sides of the river. A typical place in Turku to drink something in summer are the river boats. There are 11 reastaurant boats in the river and some of them are open even in winter. The food is usually served inside the boat, but the decks are wonderful places to drink some beer or coffee like we did on the deck of Cindy. Dave had some foreign puzzle magazines with him and while we were having our coffee, he showed me the latest products worldwide. These boats are something which is very typical of Turku. When the spring comes and sun starts to warm us and while most people would think the weather is still too cold, the first ones are celebrating the the departure of the winter on the boats drinking beer or cider. Monday I had dinner with Dave and the managing editor of Sanoma Magazines crossword/puzzle magazines. The place was Särkänlinna. It is situated on a small island just outside Helsinki. The place is beautiful, and the restaurant has been built in an old fort. The weather could have been better; It was still about 20 degrees, but the sun was behind clouds. The food was fabulous and the atmosphere was just amazing. The floor was sloping and the bottoms of the water classes were inclined to get the water level horizontal. Occationally we could smell some smoke when they were preparing salmon in the kitchen. The most amazing thing in Finland at this time of the year is the amount of light. Here the sun never drops to the ocean in 15 minutes like it does in Israel but it slides gradually down. Saturday night I took Dave back to his hotel about 2 a.m. and the northern skyline was light. On that particular moment the sun was at the lowest and instead of dusk we actually saw the dawn. Sunday we were playing games outside and at 11 p.m. we still had light from the sun. It is the only thing I really miss about Finland when travelling abroad in summer. It is even weirded in the north; the sun actually never goes down and it is really hard to go to sleep unless you are using blinds. I have an iPad from school and I am testing it for educational purposes. Dave had never used one and I showed him the latest Finnish success in games, Angry Birds. He did not quite get the idea of the game, but I explained him that it is also a puzzle. You have to figure out where to aim, since the birds have different features and so do the walls which you have to crack. I am totally addicted to the game. Unfortunately iPad is not the best device for my puzzles. Sudokus are quite nice, but the screen is definitely too small for my large picture puzzles. iPad is even worse than my Nokia N900. Nokia has a resistive touch screen and I can use a plastic pen with it. I should have my fingers sharpened in order to draw fine lines with iPad. The stylus pen I have for iPad is just a joke and actually useful for pushing buttons, not any real writing. One device that would suit very well to the puzzles is the fabulous Smart Board in my classroom. My school was very near and I showed Dave how Smart Boards can be used for teaching and how it would be like to use it with puzzle solving. Frankly the screen is actually too big. Solving a big puzzle while standing next to it is like having the paper right in front of your nose. The board worked fine, but it was not the optimal way either. When Dave dragged a line of dots to the board, the last dot was not visible because the cursor was left on top of it. After the visit to the school, I took Dave to see one of the peculiar places in Turku, Föri (in Finnish), which is a small ferry carrying pedestrians and bikers over Aura River. It's completely free and travels from bank to bank without any time table. Handy when you don't want to walk all the way to the first bridge of Turku. We travelled from one bank to another and back while we were waiting for the others for lunch on Sunday. We waited for the others on the bank of the river sitting in the shadows of very old trees. Turku is very beautiful when all the trees have leaves and on sunny days people enjoy the sun sitting on the banks of the river. We had lunch on m/s Rudolfina, which is a boat taking tourists to a cruise in the Archipelago of Turku and serves a lunch buffee along the way. The trip took two hours and the scenery is beautiful. You have to travel quite far from Turku before you can see the horizon, because everywhere we have smaller and bigger islands like in the picture. The weather was very hot when we started. The food was good and we could avoid the heat staying on the shadowy side of the boat with a little breeze cooling us. When we came back to the harbour, the first drops of water started falling down. We did not get wet, but on my way to Kaarina the rain started. The drops were huge and the lightnings were just above me. Actually the storm had broken a couple of windows in Ruissalo and also torn away the tents they had already put up for the yearly rock festival Ruisrock. It was less than 15 minutes before we were travelling past the place on the boat. Sunday night we enjoyed some traditional Finnish home cooking at my sister's place in Kaarina. The menu was created thinking of food which is not very common outside the Nordic countries. We had crepes, which were fried outside on a large pan and served hot. The crepes had fillings which were made of fish, which my brother-in-law actually catches himself. The dessert was also crepes, but filled with woodland strawberries and some vanilla cream. 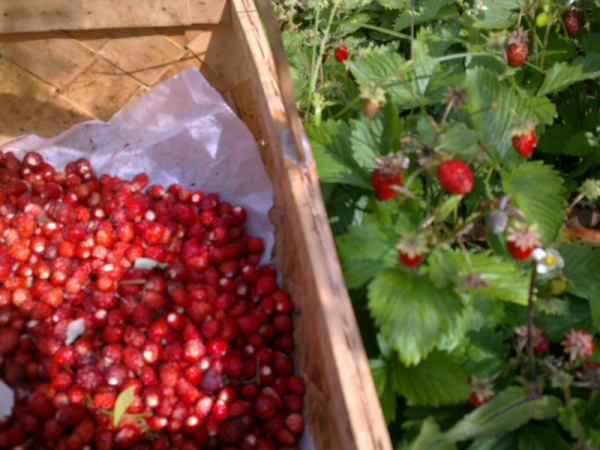 The strawberries were also picked up by Hannu, who found an excellent place to get them. They are very small compared to cultured strawberries, but they are much sweeter. They are very hard to find nowadays, but Hannu did an amazing discovery this summer. We had some fresh summer potatoes with butter, the traditional delicacy of midsummer in Finland. The potatoes do not even have peels, and we start eating them while they are still very small. The basic incredient of the Finnish menu in summer is grilled sausages with mustard. Nowadays many people have grills heated with gas, but we made them the traditional way. Hannu had also made some good liquor from Koskenkorva (Finnish vodka) and plums or cherries, which both were from their own trees. Between the meals Dave was introduced to my sisters herb garden. We did not know the names of the herbs in English, but we did not have to. Dave tasted them and could say which herb it was. Tuula also grows onions, garlic, zucchini and tomatoes. We played a couple of rounds of Mölkky, a fairly new Finnish outdoors game. It involves throwing a wooden pin and trying to knock down the other pins. You get points by certain rules and the game ends when someone gets exactly 50 points. If the limit is exceeded, the amount of points drops by 25. You can also be dropped out of the game if you miss all the pins on three rounds. It is amazing how easy it is to miss. The soft lawn makes the pin jump over the other pins without hitting anything. On Monday Dave was visiting Sanoma Magazines because Sanoma publishes Conceptis puzzles in several sudoku magazines and one picture logic magazine called Japanilaiset Ristikot. I had the great honor to go there with him and see the people who are making these magazines and also how they do it. I just loved seeing all this and hearing all the details and problems which can occur when choosing the puzzles and placing them on the magazine. Even titles take space and can force the puzzle smaller. They know what the optimal square size is, but it is not very simple to get that size on every puzzle. Finland has a long history of solving crossword puzzles, but these logic puzzles are hard to find even in Europe. I consider myself lucky to have Conceptis magazines here. I was so fascinated by all the details that I stayed longer than I was originally supposed to. I hope my opinions did not bother Dave too much. I was so thrilled about explaining how we puzzlers think (or at least some of us). The three days were filled with laughter. Dave and my son are people who notice when someone accidentally places his words wrong and make jokes about it. I love this incidental fun since it makes me pay attention to my words. It happens in my classes also. I think I have figured out my sentences but somehow they come out funny. It is good to have some laughs among the more serious studying. My family jokes a lot, and our jokes don't necessarily open up to all people. Dave shares our humor and even acts as a catalyst for others. I'll give one example, which cracked the others totally. My dog Piitu is a Welsh Corgi Pembroke and The Queen of England is famous for her Corgis and Dorgis, which is a Corgi-Dacshund hybrid. Suddenly my son asked : " Why did Elisabeth have to make a Dorgi?" No one obviously knew. The answer: "She was locked out". At this point we were still looking at each other puzzled but burst into laughter when Olli refrased the answer: "She did need a door key." Once again the joke does not work when it is written, but read it out loud. I have actually always considered myself to be weird, because I love mathematics and puzzles and love to spend my time on the computer. When my sister and his husband told Dave about their hobbies I started to think that I just seemed to look like the normal one. Hannu catches fish almost all year long with a net which he even puts under the ice. His catch is about 25 kg/year in file and he uses also roaches, which are not considered good for eating because they have quite many small bones. He puts them in cans and uses a pressure cooker. The method makes the fish so smooth that the bones dissolve in the mixture. Hannu also picks huge amounts of mushrooms and berries. Tuula grows the herbs and vegetables and it's like they are prepared to hibernate during winter time. Hannu also carves plates and bowls out of wood, makes knives and the leathercases for them and Tuula makes the decorations. Tuula makes things out of clay; candle holders, plates, lamp shades and anything you can imagine. The three days Dave was here, were like a holiday for me, even though I was spending them in my normal surroundings. Normally I don't even pay so much attention to the usual things but when I started looking at them with Dave's eyes, I noticed how wonderful Finland actually is. Dave is very good company and I enjoyed the discussions we had. I hope the other people in Conceptis take Dave's example and come here for a change instead of me going to Israel. I love Israel but talking about Finland is not the same. You have to see it yourself.